Chen Sun grew up in Hefei, China and came to Madison in 2012, after she received her BA in English Education in China. 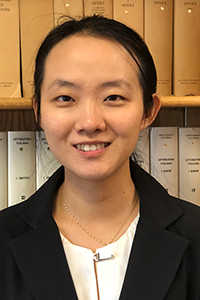 Chen received her MA in 2014 t and decided to continue her PhD study here in Madison. Chen's current research interests are second language learning and cultural pragmatics study. She's also intrigued by Labov's sociolinguistics research in African American English. She loves teaching and learning languages, and have taught English to middle school students back in China and here in Madison to visiting scholars and undergraduates. She hope her research in second language acquisition can generate useful pedagogical implications for ESL/EFL students and teachers.